Improve your CAA process and develop a more comprehensive plan of care while improving MDS 3.0 accuracy! 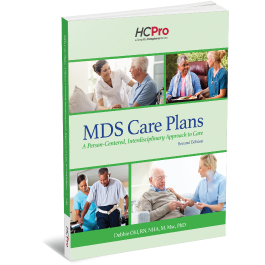 MDS Care Plans: A Person-Centered, Interdisciplinary Approach to Care, Second Edition helps you navigate recent changes to the RAI and includes more than 100 customizable care plan templates, as well as the most up-to-date care area assessment (CAA) worksheets from CMS. With many updated regulations already in effect, this timely book covers Section GG, discharge planning, QAPI, person-centered care, and survey changes, as well as the changes resulting from the ICD-10 transition. The CAA worksheets available for download in this manual will help you improve resident outcomes by knowing what to look for in each assessment. Each care plan provides a framework for guiding the review of trigger areas and clarifying a resident’s functional status and related causes of impairments. By developing a template process to complete the CAA and modifying the care plans provided in this resource, you’ll fit the individual needs of your residents while satisfying the requirements of the new assessment process. Debbie Ohl, RN, NHA, M.Msc, PhD, is a successful consultant and author of more than 35 years. She is owner and senior consultant at Ohl and Associates, a consulting practice dedicated to promoting quality outcomes and professional excellence in nursing facilities. Ohl is a registered nurse, nursing home administrator, skilled geriatric clinician, nursing home consultant, educator, and author. She is an expert in nursing facility regulatory guidelines and clinical practice, specifically assessment and care planning. Rosanna L. Benbow, RN, CCM, CIC, DNS-CT, RAC-CT, offers MDS consultation and a variety of other consulting for postacute care clients. Services for interim and PRN MDS nurses are also available through Leading Transitions. Benbow has over 22 years of experience in the long-term care industry, where she began as a certified nursing assistant. She has extensive clinical reimbursement experience in roles such as director of nursing, MDS coordinator, case-mix auditor, clinical IT specialist, and MDS/reimbursement consultant. While focusing on MDS and case management, Benbow has been highly involved in accountable care organization partnerships, policy development, Interact 3.0 implementation, and QAPI program development. Benbow is involved in several committees with AANAC and is a Certified InterACT Champion. She was a presenter at the 2014, 2015, and 2018 AANAC Conferences, where she spoke on managed care. She also does routine presentations for LeadingAge Indiana and Hoosier Owners and Providers for the Elderly.